The city may be having an unseasonably warm December, but it’s fair to say most New Yorkers still find it a bit too chilly for the beach. Members of the famed Coney Island Polar Bear Club, on the other hand, relish the drop in temperature as they head out for an ocean swim. The Polar Bear Club is a New York institution dating back to 1903. 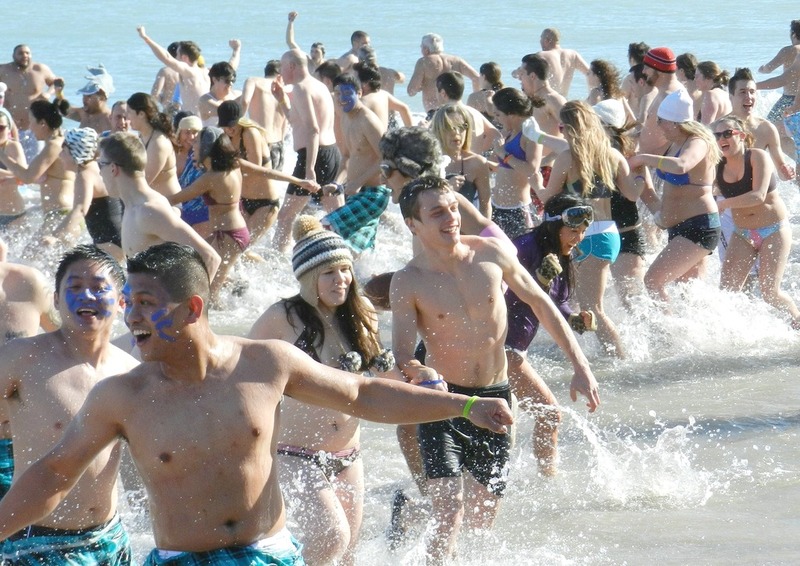 While the organization is renowned for its annual New Year’s Day swim where New Yorkers gather to welcome the year with a chilly dip, it’s far from the only time the club embraces the cold water. In fact, they meet 12 times throughout the winter months and draw a sizable membership that’s a mix of ages, backgrounds, and cultures from the metropolitan area and beyond. At the club’s helm is president Dennis Thomas, who fell in love with Coney Island years ago and later discovered the serenity of swimming on brisk days. More than thirty years after he first became a member, Dennis spoke with 6sqft about the Polar Bear Club’s history, what a typical swim is like, and what happens when hundreds of New Yorkers turn out for a New Year’s Day swim that supports Camp Sunshine. 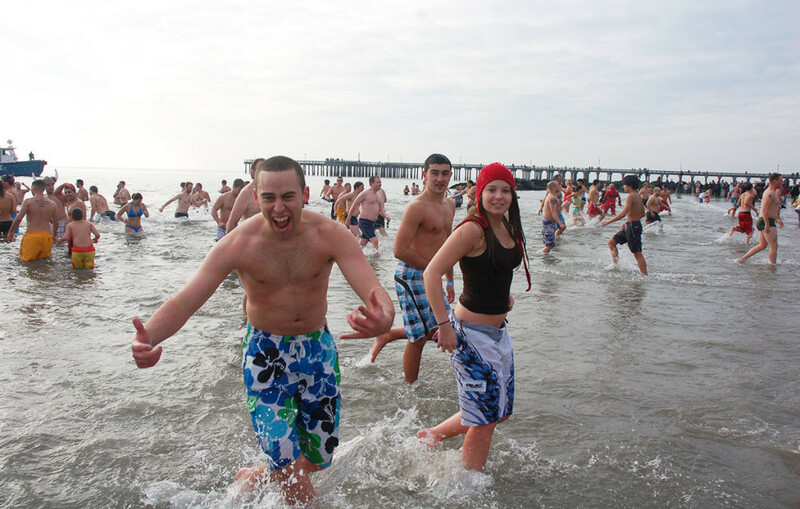 How did you first get involved with the Coney Island Polar Bear Club? Can you share a bit about the organization’s founding? We were founded in 1903 by Bernarr Macfadden, who was a very interesting character. In many ways he was ahead of his time in terms of physical culture, value of recreation, and living a healthy life and eating well. 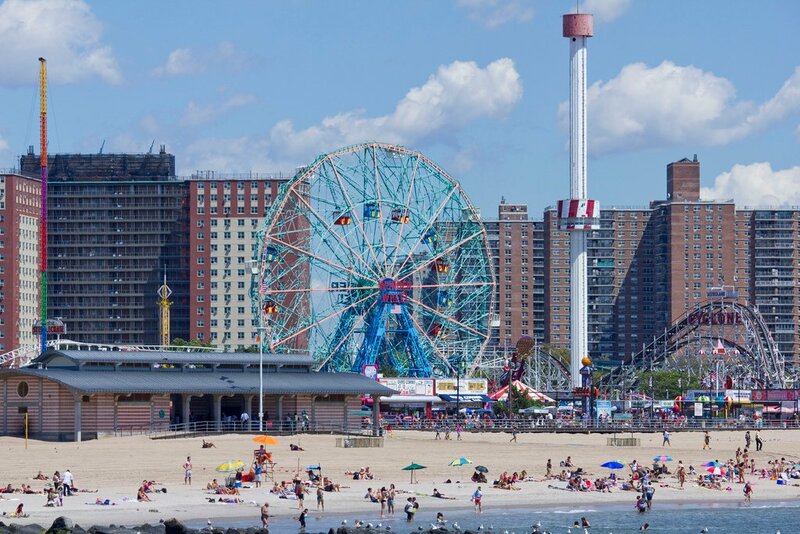 I like to say that we’re the oldest living landmark in Coney Island right now. We’re older than the Wonder Wheel and the parachute drop. Has the club changed over the years? We reorganized about 10-15 years ago. There was a point where there were 8-12 of us left and we didn’t have a regular place to meet and change. So, we put up a website where people could find us and welcomed more members. Being able to use the New York Education Hall at the Aquarium to meet and change has been great for us. Now we have more than 100 members and unfortunately have to turn people away because we don’t have room to accommodate everyone comfortably. I never in my life thought that would happen. For someone who has never swam in the colder months, what is the experience like? I’ll say it’s cold; let’s start there. If you can get past a threshold of two to three minutes, you’ll be surprised how long you can stay in. There’s something called runner’s high among marathon runners. For me, personally, jumping in the ocean in really cold water clears my head. It’s an activity that’s not about our daily life. All that baggage and stress that comes from living in a place like New York City–you can’t think about any of that when you’re in the water. It’s about the immediacy and intensity of this experience. How often do members gather for a swim? Most people don’t realize that it’s a bigger commitment than the New Year’s Day swim. We swim every Sunday at 1pm from November through April at Coney Island. Right now we do 12 swims a season for somebody to become a full-time member. Does the group have any pre-swim rituals? Once everyone is in the water, what do they do? Once everyone gets in the water, we form a circle holding hands and no one lets go until we have a complete circle, which is a little harder to manage when you have 90 people. After that it’s free swim. We have a number of people who are dedicated open water swimmers, but the majority are just there for a plunge. Some people will bring tennis balls to throw around, while others chat. I would say the average person probably spends at least ten minutes in the water throughout most of the season. Obviously, we have a warm fall right now where the water is 51 degrees and really manageable, but once you get into February it gets much colder. Usually at Coney Island we can get as low as 31 degrees. How is it getting out of the water? You have to realize that once you’re out of the water, you still have a good walk back to the boardwalk. I find that once I’m out, I can stand outside for another five minutes really easily without a towel and drip dry depending on the weather. It’s only on the worst days when you have a howling wind chill that you might get out and run back. How many people participate in the New Year’s swim? We’ve been getting around 2,500 swimmers each New Year’s Day, and I would say we have three to four times as many spectators. We used to let everyone in at 1:00, but it was pandemonium and madness. What we’ve been doing lately is issuing wristbands in certain colors and sending them into the water in waves of 200 people at a time. It’s much more organized and safer for everybody. And often on New Year’s people will stay in a minute or two, maybe three, and get out. For those coming out for the first time, what do you recommend? First of all, we recommend you wear surf boots or an old pair of sneakers you don’t mind getting wet. Your feet are in contact with the ground the whole time. They will get cold and a little insulation helps a lot. We ask people not to run into knee deep water and dive in because you can get hurt that way. I suggest people get in rather briskly, though. If you want the full experience you go up at least to your neck, but you can dunk if you like. I also encourage people to scream as much as they like. Something else I would tell first timers is that we’re not here to suffer. We’re not here to turn this into a macho challenge to see if I can stay in longer than you. It really is up to you to stay in as long as you’re comfortable and having fun. And if it’s not fun, then get out and find something else that is. The New Year’s swim raises money for Camp Sunshine. Can you share a bit about this charity? Camp Sunshine takes children with serious diseases and their families up to a camp environment in Maine to get away from all the stress of daily life. They’ve been a charity partner with us for probably eight years or so. I introduce the head of fundraising at Camp Sunshine as my best friend for four months of the year because we are talking all the time getting stuff ready. I think we’ve raised over $300,000 for them since we started this partnership and hope to increase that every year. It’s always been important to me that this event is free; this is something we do so other people can enjoy something that is a little different from what they normally do. If we can do that and still raise funds for Camp Sunshine, then I am really happy to be doing both. We do suggest a $20 donation, and a lot of New Yorkers are much more generous than that because they realize it takes a lot of money to put this together. Looking back over the last thirty years, how has Coney Island changed? It is not the decrepit, falling apart, neglected environment it used to be. In many ways, I was sorry to see that go. But on the other hand, I can’t embrace my own nostalgic view and say it was better because right now there are more people coming every summer. Even in the winter, it’s not desolate and there are more rides, activities, restaurants, and businesses. It’s a great thing for New York to realize what a gold mine this place is and try to revive it and make it a vital economic engine. What does carrying on this Coney Island tradition mean to you? It’s a way of engaging in the history of the place. If you’ve read any book about Coney Island, it’s the history of weirdness out there. It’s always been an odd scene, and for us to maintain this tradition and offer it to anyone who wants to participate in it, I think is great. We put on the biggest off-season event in Coney Island. People are pushing their boundaries a little bit, and yes they’re cold, but a lot of them come back year after year. 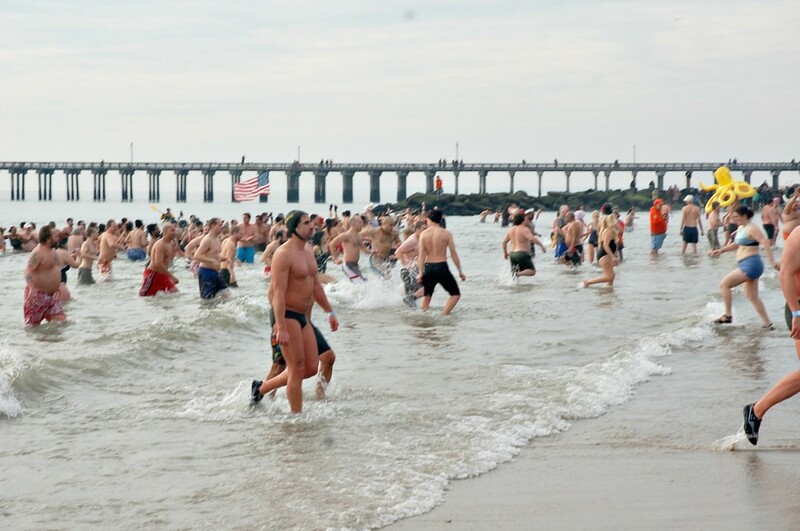 The Coney Island Polar Bear Club‘s annual New Year’s Day swim takes place on January 1st and begins at 1:00pm on the dot. Swimmers are advised to arrive early and to dress in warm clothes, including an old pair of sneakers or surf boots. There is a suggested $20 donation to Camp Sunshine for each participant.